Well, the reality is that it does not cost very much to make a tablet of Harvoni® (about $1 to $2). Let's face it $1000 and is a lot of money for a single tablet, after all it will buy you a new iPhone and that's a lot more complicated than a pill. The $31,000 for a bottle of Harvoni® is the same as the price of a new car. And while $94,000 won't buy you a whole house in most places it is actually 1/2 the median price for a house in the USA. 3 Bottles of pills cost the same as 1/2 a house? Really? Ok, I hear you say "So now I can understand that the price of Harvoni® represents outrageous price gouging, but that still does not prove the less expensive generics meet the required quality standard now does it?" Fair point, and one that is answered by a set of tests called "bioequivalence" (BE). Bioequivalence testing starts with baseline things like high-quality factories, using high-quality active ingredients and putting them together into tablets under what is called GMP (Good Manufacturing Practice). GMP is a series of processes that provision QC (Quality Control) / QA (Quality Assurance). Ok, so now we have some tablets. They are in a nice bottle and have been made by experts. These experts have put their brand name on them but... that still does not prove those tablets are going to work the same. Why? The why is because for a generic tablet to work the same as the originator it needs to have more than the same APIs (Active Pharmaceutical Ingredients) in the correct weights. These tablets also need to be formulated correctly to ensure that when a patient takes them (be it generic or originator) the product delivers the same blood levels to the patients. So how do we do that? It's actually really simple. We recruit 24-60 volunteers. We give 1/2 of them the originator medication and the other 1/2 the generic. We then make 20 measurements of the blood levels over the next 12 hours. Then we wait a week for the drugs to wash out. Then we repeat the testing but the patients who had the generic first time around now get the originator, and the patients who got the originator now get the generic. This may then be repeated again (fully replicated). A product is deemed to be bioequivalent if the blood levels at all time points demonstrate the statistical confidence interval (CI) fall within the range 80% - 125%. Oh, I hear you say, "Does that mean a bioequivalent generic can have up to 20% less or 25% more drug in it?" Not at all, because I said "confidence interval". Ok, I hear you say, "WTF is a confidence interval?" Glad you asked, although your eyes may glaze over! What I want you to notice are 2 things. The more tests we do the more accurate the actual results become and the narrower the confidence interval becomes. With the 100 toss trial the 39% lower confidence interval is 22% lower than the expected 50% and the 59% upper confidence interval is 18% higher so it spans the confidence interval range on the actual value of 50% from 78% - 118% - you may note that this is similar to the bioequivalence threshold of 80% (-20%) to 125% (+25%). What this means in practical terms is that when we test for bioequivalence the actual values at any point need to be very close together to meet the statistical confidence interval criteria and we need to do a lot of tests to narrow the CI range down. Here's what it actually looks like and as you can see these generic products are very very similar to the originator product. The key values of Cmax (Concentration maximum) and AUC (Area Under the Curve and a measure of total absorption) vary only by a low single digit % amount. Some are a little higher, some are a little lower. All are very similar in absolute and statistical terms. In the world of Hepatitis C patients, Twinvir started to pick on mythical proportions. It seldom happens that a generic drug, no matter how successful, becomes so quickly known to the patients who need it. Twinvir pills (sofosbuvir 400 mg / ledipasvir 90 mg) produced by Incepta Pharmaceuticals in currently one of the best-selling generic medications in the world. How did these pills from Bangladesh get so popular and well known? Let's put ourselves in the shoes of Joe, a Hepatitis C patient, in late 2013. When Joe was diagnosed with genotype 1, he was told that he had Hepatitis C for more than 10 years but now things are starting to go bad for his liver. He needs a cure as soon as possible. At that time the only cure available was treatment with interferon injections and supplemented by ribavirin pills. If Joe went with this treatment, there were 50% chances he'll get well in half a year. However, there is also 50% of chances that his liver will not respond to treatment. Luckily, in December 2013 he got another option for treatment. Gilead Sciences, a pharmaceutical company, had just developed and started to market a Hepatitis C wonder drug called Sovaldi (sofosbuvir 400mg). According to clinical trials, the cure rate is more than 90% in only 12-week treatment. The newly developed Harvoni is even better. With his life in danger, Joe was very happy to see the miracle of modern science and was more than willing to go on treatment. However, what Joe did not plan is the price of the treatment. The price tag of Harvoni was $94,5000 per treatment. The meds do save lives but $94,500 is still a very large sum. This is where Twinvir enters the story. The company producing Harvoni, Gilead Sciences, was reaping sales record all over the US and Europe. However, they had major problems with third world countries - not only did they knew barely anybody in lets say India or Egypt will be able to afford the medicine at high prices, India additionally challenged Gilead because of the lack of innovation that went into developing the sofosbuvir molecule (it really does look like other antivirals). Consequently, as a matter of good will, Gilead gave licences to several Indian and other companies, including Incepta Pharmaceuticals, to produce generic Sovaldi and Harvoni. Twinvir is thus a miracle drug that was brought to market with quite a miraculous way. Usually, pharmaceutical companies use patents on molecules to keep generics out of the game for 10 years or more. However, Twinvir was being produced, sold and used for treatment only a good year after the first launch of Sovaldi. Produced in Bangladesh, many Hepatitis C patients from the US, Australia and Europe were looking a way to get the necessary medications - but why looking for Twinvir when you have the original version of Harvoni at your local pharmacy? Here the main reason why our patient Joe decided to go to Bangladesh and produce Twinvir - the cost of Twinvir. While Harvoni in the US costs $94,500, exactly the same pills (generic version) costs less than $1,000 in Bangladesh and India. This miraculous drug at low cost is known as Twinvir, and because many patients had a very good incentive to get it, Twinvir's availability and recognition came with it. There is a major difference between price of Twinvir and Harvoni but no difference in effectiveness. Generic medications have to be by regulation of equal effectiveness (measured by comparing bioavailability of both Twinvir and Harvoni) than the originals. What is more, in this case Gilead practically have the plans how to create sofosbuvir pills to Incepta as a part of their licencing agreement. When Gilead representatives were asked how will they fight patients seeking the low-priced Twinvir and other sofosbuvir-based medications from India, Gilead EVP Gregg Alton told the news service: "We aren't surprised; we knew this was going to happen. This is a reality of having these types of programs. As soon as a gray market develops, there isn't much we can do to control it at a pharmacy level." In short, patients who are going to die without a cure, will rather seek out $1,000 cure than the $94,500. This is not surprising but it may not be 100% legal to do so. Nevertheless, as Gilead has little control over what patients can do, there is another factor to include - a moral factor. It is understood that pharmaceutical companies spend money for drug research, development, marketing and other costs, and still reap the enormous corporate profits. However, from moral standpoint, when lives are at risk, the business model should at least party change. In other words, if you have developed a cure for Hepatitis C, you are at least partially obligated to help Hepatitis C patients. What Gilead is actually doing is putting enormous price tags on the developed drugs - which is more considered health profiteering than helping people in need. People seeking Twinvir overseas is a natural response of the population that desperately needs the medicines. If you can get a whole treatment regimen of Twinvir for a single pill of Harvoni, you will be very inclined to buy it. In the end, Joe will more than likely decide to buy Twinvir than Harvoni. 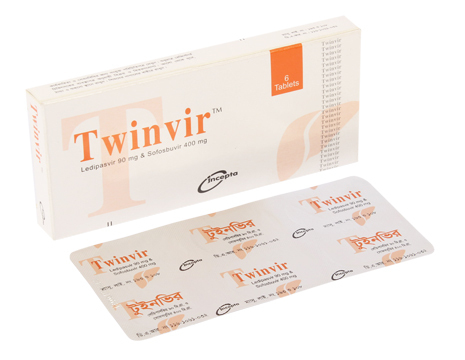 Here you can see a short video about Incepta's Twinvir, a low-cost version of Harvoni. We had a lot of talk about Twinvir on our forum at FixHepC.com, and you're welcome to see what opinions patients had shared about Twinvir and ask them anything about the meds. Remember, they are the ones who have first-hand experience with it. You can access our forum here. As always, there is a very easy and save legitimate way of getting generic Sovaldi or Harvoni. You can contact Dr. James Freeman and us and we'll help you get the medicines you need. Hepatitis C is no longer a death sentence. Why are people still dying because of it? New age Hepatitis C medicines are more than just a medical wonder. They gave humanity an ability to save lives. How good are we at saving those lives? Hepatitis C is a serious disease that ultimately results in death of patients. Approximately 500,000 people die from Hepatitis C and related illnesses in 2013 alone, more than 20,000 of them were US citizens. To put it in perspective: HIV/AIDS has longed been talked about as a very serious disease with a disastrous death toll. However, according to Dr. Laura J. Martin of WebMD nowadays more people die from Hepatitis C than from HIV/AIDS. Today, there are more than 3.2 million of Hepatitis C patients in the US alone. In late 2013, however, humanity had a break-through that should by all accounts drastically change lives of people living with Hepatitis C. A new drug, Sovaldi (400mg sofosobuvir), was approved in December 2013 on the US market. With it, more than 90% of people with Hepatitis C can be cured. But are they really being cured? Polio, for example, was a very serious disease with a disastrous outcome. However, after discovering an efficient polio vaccine, the number of patient and number of death relating to polio was reduced dramatically. Hepatitis C prior to 2013 was a very problematic disease because it caused death via liver cirrhosis and liver cancer, and the only treatment we had was 50% efficient. Hepatitis C patients were put on 6-months long interferon-based treatment which consisted of injecting oneself with interferon and taking additional oral medicines such as ribavirin (antiviral molecule). Nonetheless, for 1 out of every 2 patients treated the treatment has been proven to be unsuccessful. There was a need for an efficient cure. Newly-discovered sofosbuvir molecule was the answer. With the launch of Sovaldi and Harvoni medicines by a company Gilead Sciences, humanity finally attained a very effective cure for Hepatitis C. Being an all-oral regimen, sofosbuvir pills are taken on a daily basis for 12-weeks (standard treatment), have mild side effects and, above all, more than 95% cure rate. This is what in pharmaceutical industry refer to as a game-changer. Now almost everyone can be cured and Hepatitis C suddenly became an easily curable disease. Does anybody die of Hepatitis C now? Simple answer is 'YES'. While the number of deaths has decreased from 500,000 per year, there are still hundreds of thousands of people dying every year. The reason: Hepatitis C.
But if we know Hepatitis C is so easily treatable nowadays, why are people still dying? When we spoke about Harvoni and Sovaldi being a game-changer in industrial industry, it was meant more in profits than in saving lives. Here are two simple reasons why people even in the developed world are still dying of Hepatitis C.
With this in mind, let us calculate the US Hepatitis C market. If we know there are 3,2 million Hepatitis C patients, each in need of an $80,000 cure, the total comes to staggering number: Gilead Sciences is looking to sell more than $250 billion worth of Hepatitis C medicine to patients who can die without it. Here is a horrifying realization. We have people who will die without the cure. We have the cure. But people who are dying cannot afford the cure because it is priced extremely high. 'What have we come to as a society?' is the right question here. Gilead Sciences, company that markets Sovaldi and Harvoni, offered licences to Indian manufacturers to produce generic version of sofosbuvir-based medicines. In short, India refused to recognise a level of innovation for sofosbuvir molecule that would grant Gilead Sciences a patent and monopoly over Hepatitis C market in India. This created a loophole. This loophole is now saving lives. All around the world there are Hepatitis C patients that will die without getting the cure - and they are not getting it because the prices of the drugs are so extremely high. This is where FixHepC Buyers Club comes in. It is our mission to deliver life-saving Hepatitis C medicines to your doorstep for a negligible cost. We have set up a supply chain consisting of sofosbuvir production, packaging and distribution across the world. It is our hope this will bring down the Hepatitis C death toll under 100,000 and that in near future Hepatitis C death cases will be as few in number as possible with sofosbuvir-based medication. We strive to deliver generic Harvoni anywhere on the planet for less than $2,000 per treatment in about 2-3 weeks. With this prices, we could cure all Hepatitis C patients in the US for less than $7 billion. Are thing in Hepatitis C market likely to change? Hardly. Pharmaceutical industry holds on to patents for drugs that last for 20- to 25-years. During this time, the prices of original Sovaldi and Harvoni will be extremely high, and Hepatitis C patients don't have 20 or more year to wait for patents to expire.